SAO PAULO -- In some of his first words to the nation as president-elect, far-right politician Jair Bolsonaro promised to defend the constitution and unite a bitterly divided populace. His left-wing rival immediately vowed to mount a vigorous opposition, while rights groups warned against a rollback of civil liberties. That juxtaposition underscored the reality that the end of the election was not the end of acrimony and that myriad challenges lay ahead for Latin America's largest nation. Bolsonaro appeared to try to allay those concerns Sunday night, saying he would "pacify" Brazil following a race that revealed deep divisions and was repeatedly marred by violence. The candidate himself was stabbed and almost died while campaigning in early September, and there were numerous reports of politically motivated violence, especially directed at gay people. "This country belongs to all of us, Brazilians by birth or by heart, a Brazil of diverse opinions, colors and orientations," he said, reading off a sheet of paper in a live television address. 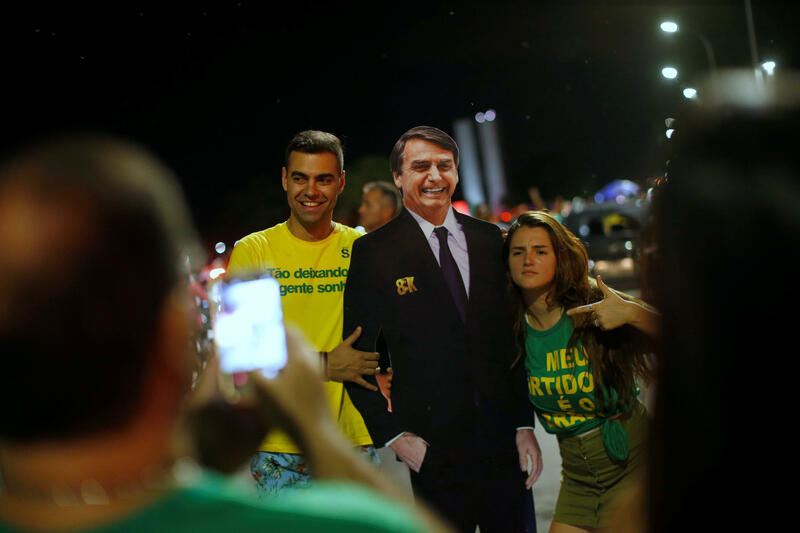 His victory moved Brazil, the world's fourth-largest democracy, sharply to the right after four consecutive elections in which candidates from the left-leaning Workers' Party won. White House Press Secretary Sarah Sanders issued a statement late Sunday saying, "President Trump called President-elect Bolsonaro of Brazil this evening to congratulate him and the Brazilian people on today's elections. Both expressed a strong commitment to work side-by-side to improve the lives of the people of the United States and Brazil, and as regional leaders, of the Americas." Bolsonaro's appeal to voters for a return to "traditional values," his embrace of social media messaging as a way to communicate directly with the public and his brash style have led to some Brazilian media dubbing him the "Trump of the Tropics." His rhetoric has shown stark parallels with Mr. Trump. Like other right-leaning leaders who have risen to power around the globe, Bolsonaro built his popularity on a mixture of tough talk and hardline positions. And, like many, he is sure to face stiff pushback from groups concerned that his strong views will lead to policies that threaten democratic institutions and roll back civil rights in what remains a young democracy. He has frequently disparaged women, gays and blacks, and said he would name military men to his Cabinet. Bolsonaro spent much of the campaign exploiting divisions, taking to Twitter to lambaste the rival Workers' Party as unethical and dangerous. In recent weeks, Brazilians were bombarded with WhatsApp messages that condemned Workers' Party candidate Fernando Haddad, often making outrageous claims. Ultimately, Bolsonaro's messages resonated with Brazilians hungry for change: He got just over 55 percent of the votes Sunday, compared to right under 45 percent for Haddad. Haddad promised a fight while saying he would respect the country's institutions. "We have the responsibility to mount an opposition, putting national interests, the interests of the entire Brazilian people, above everything," Haddad said in a speech to supporters. "Brazil has possibly never needed the exercise of citizenship more than right now." In a sign of how tense the race got, Haddad did not congratulate Bolsonaro, whom he had accused of spreading lies about him and his family. Amid the celebrations by Bolsonaro's supporters, there were also reports of some clashes between his backers and opponents. The rise of Bolsonaro, who cast himself as a political outsider despite a largely lackluster 27-year career in Congress, parallels the emergence of hard-right leaders in many countries. But his extreme messages were rendered more palatable by a perfect storm in Brazil: widespread anger at the political class after years of corruption, an economy that has struggled to recover from a punishing recession and a surge in violence. In particular, many Brazilians were furious with the Workers' Party for its role in the graft scheme revealed by the "Operation Car Wash" investigation, which uncovered billions of dollars in bribes paid to politicians via inflated construction contracts. Haddad struggled to build momentum with his promises of a return to the boom times by investing in health and education and reducing poverty. It didn't help that the man who appointed Haddad as the party's candidate, former President Luiz Inacio da Silva, is serving a 12-year sentence for a corruption conviction. Within minutes of Bolsonaro's victory being declared, international civil rights groups expressed concerns. Human Rights Watch called on Brazil's judiciary and other institutions to "resist any attempt to undermine human rights, the rule of law and democracy under Jair Bolsonaro's government." Steve Schwartzman of the Environmental Defense Fund warned that Bolsonaro's promises about the environment would be "dangerous to the planet." Bolsonaro has repeatedly said he would pull Brazil from the Paris agreement on climate change, though last week he backed off on that. He has also promised to cut environmental regulations and make Brazil friendlier to international investors. The past few years in Brazil have been exceptionally turbulent. In 2016, then-President Dilma Rousseff of the Workers' Party was impeached and removed from office on charges that many on the left felt were politically motivated. The economy suffered a two-year recession and is only now beginning to emerge, with growth stagnant and unemployment high. Dozens of politicians and executives have been jailed in the corruption investigation. Many observers had predicted a newcomer would emerge to harness the anti-establishment anger. Instead, support coalesced around Bolsonaro, who at the margins in Congress painted himself as just the strong man Brazil needed to dismantle a failing system. Bolsonaro has promised to crack down on violent crime and drastically reduce the size of Brazil's state. But many of the details of his positions remain unclear since he has largely conducted his campaign via blasts on social media. After he was stabbed, he declined to debate Haddad and gave interviews only to largely friendly media who rarely asked tough questions. "Tomorrow we start a new country," said Mario Marcondes, a 61-year-old pilot who gathered with other supporters outside Bolsonaro's house. "This was like a soccer game, a dispute that is over. Now we will all know to unite." French far-right leader Marine Le Pen sent a message of encouragement to Bolsonaro. She wished him "good luck" via her official Twitter account Monday. She said he will have to "rectify the very fragile economic, security and democratic situation of Brazil." She also interpreted the results as a rebuke by Brazilians of "the widespread corruption and terrifying crime that flourished under far-left governments." Le Pen has had consistent praise for populist leaders around the world. But the spokesperson for French President Emmanuel Macron's centrist party in parliament, Aurore Berge tweeted a warning over the Brazilian election results that "no democracy is safe."